It’s not who you are, it’s where you’re going…. There have been many ships and planes “lost” in what is known as “the Bermuda Triangle,” a mysterious area of the Caribbean just south of the US, with unexplained phenomena and unusual happenings. At least, that’s the way it was back in the ’70’s, when imaginations ran wild with ideas of various people being transported to who knows where, or even who knows when. 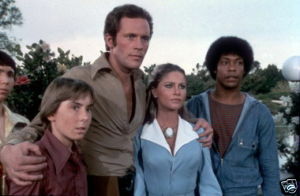 While it was always a wonder about where they ended up, one show in the ’70’s decided to use those concepts to tell stories about all sorts of possible destinations. On this show, it was all about The Fantastic Journey. 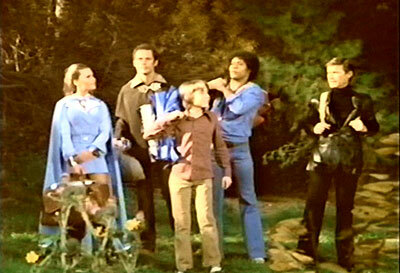 The Fantastic Journey aired 10 episodes on NBC beginning in 1976. 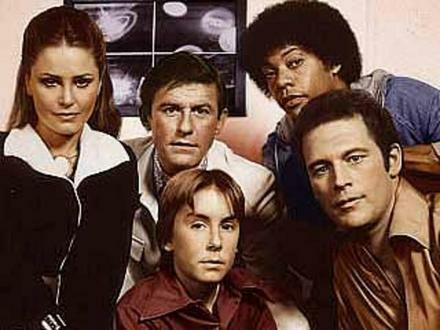 The initial pilot concerned a small group of scientists exploring the questions of the Bermuda Triangle, and becoming part of the unknown themselves when their sailing vessel is swallowed up by a mysterious green cloud (and you KNOW it’s mysterious because it’s GREEN, such easy television shorthand that it got used in a similar show a decade later). The passengers awaken on an island, shipwrecked, unable to contact the mainland, and wondering how to survive. Included are Dr. Fred Walters (Carl Franklin), a doctor just graduated out of school, who was acting as the medical advisor for the group. He is joined by young Scott Jordan (Ike Eisenmann), the son of the scientist in charge of the expedition, and a history buff whose inquisitive nature sometimes causes problems. While there were others who survived the wreck, they didn’t survive the pilot, as some characters (including Scott’s father) were “lucky” enough to be sent home, as the initial episode was “adjusted” to eliminate them, leaving only Varian, Dr. Walters and Scott. Varian becomes the de facto leader of the small band, and he tells them the island they’re on houses many different times and places, all at once, and their way home lies somewhere in a place called “Evoland” many “time zones” away. 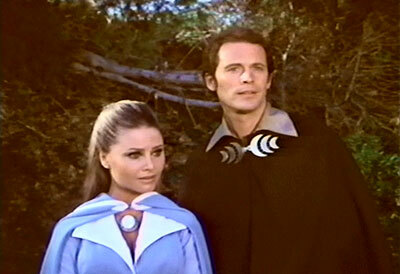 Their first journey after the pilot leads them away from the 16th century into a place called Atlantium, where they gain another traveler (or, really, two). Liana (Katie Saylor) is a woman with an unusual heritage, said to be the daughter of an extraterrestrial mother who joined with her human father. Deceptively strong due to her mixed parentage, she also possesses increased mental abilities, including telepathic skills. She utilizes these with her pet, Sil-el, who appears to us as a cat (but quite possibly could be something more). Liana doesn’t trust the new government of Atlantium (nor should she, honestly), so she decides to join Varian and company on her own search for home. 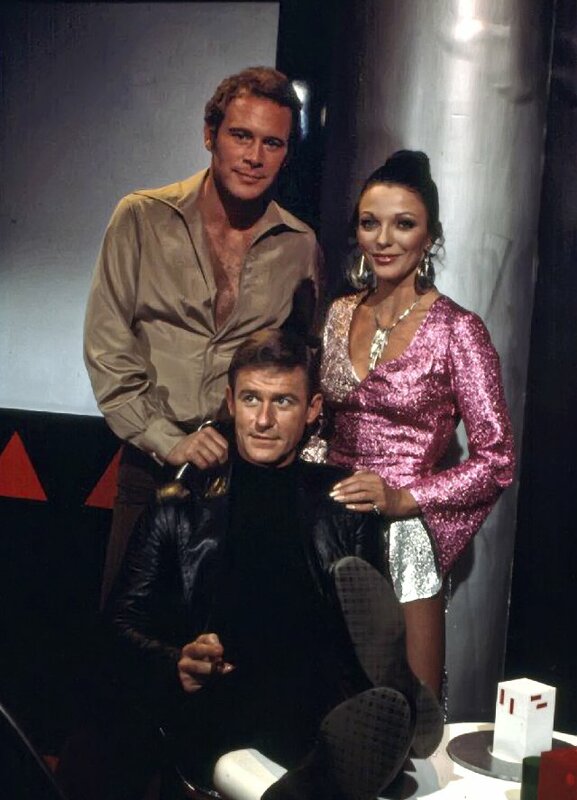 Varian, Dr.Willoway, and guest Joan Collins in the episode "Turnabout"
The next stop of the group, in the third episode, picks up another member for their journey. 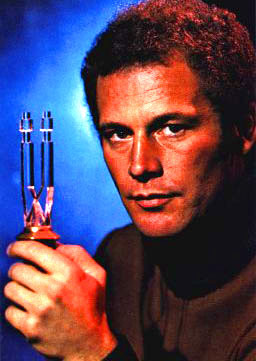 Dr. Jonathan Willoway (Roddy McDowall) is a scientist from the 1960’s, but years ahead in pure scientific knowledge. Trapped in a world of androids, he sees the group as a way to avoid his confinement and, although he has few skills to get along with other humans, he becomes a reluctant addition to the party. At least initially, Willoway inhabits the “villain” role in stories, due to his selfishness and inability to relate to the others. While at first this plays more like the comedic Dr. Smith of Lost in Space, McDowall’s talents (and some extensive script work) create a much more likable character in later episodes. While there are still opposing views in place (Varian’s pacifist nature, Scott’s inquisitiveness, Liana’s non-human values), the group goes on together for the good of all. It also makes telling stories much easier when you don’t have pesky rules around to get in the way. Lansbury’s original idea was much more based in historical settings, although futuristic ones were possible. As a history buff, Scott was going to be one of the sources for information, as was Dr. Walters for his medical knowledge. But in a purely science fiction/fantasy premise, characters with advanced ideas were needed, especially when their explanations could be adjusted for story purposes; hence, the addition of Liana and Dr. Willoway to the group. All those changes would suppose the series was about the characters themselves. Perhaps that would have been more true if The Fantastic Journey had lasted longer than a mere 10 episodes. But initially, the series was about the amazing places the group would discover as they made their way towards Evoland and, possibly, a way home. It was not about significant character growth. There’s a good reason the show’s title is The Fantastic Journey. It’s really about all the places they went, and the cultures they encountered. While I admit freely that I may have been a bit disparaging of this series at one time (especially when I discussed a similar series, Otherworld), more recently I’ve discovered something that’s true about many shows: different shows balance character and context in vastly different ways. Two shows (like The Fantastic Journey and Otherworld in this example) might be very similar in premise, but they can be light years apart in execution. And while I may like one over the other, for reasons of personal preference, they can both be successful at what they wanted to do. I came to see The Fantastic Journey in a new, better light, simply because I realized it wasn’t about the characters, and my desires for their growth. It really was about the journey… and showing the journey is exactly what the show set out to do. A "women's liberation" story in scantily clad costumes. Of course. Welcome to the '70's. The world encountered might be one filled with only children, or an examination of violence among a society of pacifists, or the old SF saw about a world run by only women and the idea of “male liberation.” Each world was used to portray, through both the world itself and the reaction of our “outsider” characters, different points of view in a dramatic context. 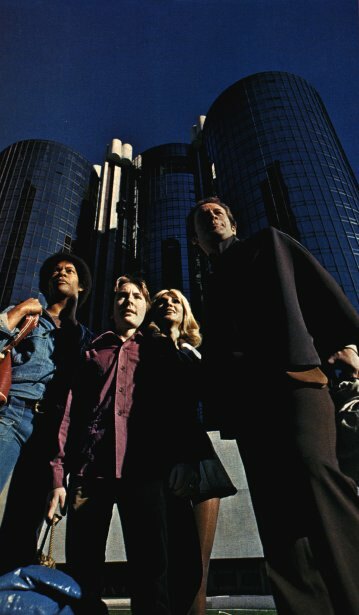 And although the 1970’s view of “right” often prevailed, there’s enough shown from the more futuristic characters to see that there might be better ways to approach things than what existed in the past. Because of this emphasis on message over character, individual advancement and growth of the regulars became pushed to the background, to the detriment of some very good actors. But hopefully the actors knew that going in, simply because the stated premise of the show wasn’t about them, but what they encountered. If it was just about the characters, Lansbury and company might have just kept the original cast from the pilot and gone on from there, but they didn’t. They assembled points of view instead. There’s a balance on most shows between “character” and “situation,” and each show on television weighs that balance differently. Some shows lean heavily toward the “character” side of the equation, and that’s where I believed Otherworld thrived, even when their premise and the “civilization of the week” ideas of The Fantastic Journey held much in common. But I’ve since realized both shows succeed on their own merits, simply because The Fantastic Journey, even in its title, set out to be about the trip and not the people involved. I criticized the show for having characters as ciphers, merely to set out different points of view for each society they met… and yet, since that was the actual goal, the creators and actors really did do their jobs admirably. In my limited view, I just thought, initially, that it should be a different job. But I was wrong. Even the labors involved in the recasting (which took three episodes of the series to accomplish) showed that the producers were more interested in exploring the ideas inherent in the portrayed societies than in our characters’ growth. Their character reactions were interesting, certainly, but served a wider canvas than just the effects upon their person. The commentary on each society was designed to show the characters from our own time a new and sometimes better place. That commentary also meant to show the “future” characters that those from our time might actually have gotten something right, something they may have lost in their attempts at enlightenment. We current-day humans may not have all the answers, but we’ve got a few good ideas, and we’re willing to both teach and learn from the future. And I’m willing to learn, too. It’s all part of The Fantastic Journey. In a search for answers to the Bermuda Triangle, Dr. Walters and Scott found an entire world full of ideas, choices, and discoveries to experience, and others joined them in their travels searching for their own solutions. And while The Fantastic Journey was about those larger notions, the most important one was ultimately finding their way back, utilizing the differences and strengths of each other to help in their own travels. And together, through all these wonderful experiences, they might actually find their way home, and learn something along the way. CARL FRANKLIN (Dr. Fred Walters) was a guest star on many shows in the ’80’s, most notably as a recurring character chasing The A-Team. He’s focused primarily on directing since the early ’90’s, most recently with an episode of Falling Skies this past season. As a director and screenwriter, he (and the film) won multiple awards for Devil in a Blue Dress, a film noir set in the late ’40’s featuring Denzel Washington and Don Cheadle. IKE EISENMANN (Scott Jordan) is well-known to genre fans as Cadet Peter Preston in Star Trek II: The Wrath of Khan, and made his mark starring in the original Disney films Escape from Witch Mountain and the sequel Return to Witch Mountain. In later years, he worked in post-production roles on many animated and live-action projects, both becoming a sound engineer and lending his voice to occasional characters. JARED MARTIN (Varian) first came to prominence in The Fantastic Journey, but he’d appeared in many series previously, including The Rookies, Night Gallery, and Columbo. He’s best known to the public at large for his recurring role as “Dusty” Farlow on Dallas, and was one of the leading fan suspects for the famous “Who shot J.R.?” plot (even though the producers hadn’t considered him at the time!) He starred in the television version of War of the Worlds, and later created the Big Picture Alliance, helping introduce inner city youth in Philadelphia to filmmaking and production, a task he was heavily involved with for the next 15 years. KATIE SAYLOR (Liana) had appeared on Police Story and Cannon prior to her role on The Fantastic Journey. She unfortunately became severely ill during production of the series, forcing her to bow out of the final two episodes, and her recovery apparently took approximately a year. She retired from the acting business as a result of her health issues, and reportedly passed away due to cancer in 1991. RODDY McDOWALL (Dr. Jonathan Willoway) was featured on this site for his lead role on the televised version of Planet of the Apes, portraying a similar character to the ones he’d played in the original feature film series. Popular and well-mannered, he’s remembered as one of Hollywood’s last real gentleman stars, and his collection of early film and television memorabilia now is kept by the Motion Picture Academy (the people who give out the Oscars). Willoway was actually written specifically to interest McDowall in the part, as the producers wanted him to join their series… and after reading the script, he did! The Fantastic Journey is unavailable as a commercial DVD, so the bootleg route is the only reasonable way to see them all. The opening is available on YouTube, as are a few episodes (in chunks, of course). The show itself is well-remembered by many, even though it lasted a relatively short time, and there’s a great fan site here with information on the series stars, episodes, and a few articles published during the original run. Oddly enough, the above quote comes from Martin in early April of 1977, not quite two months before the original Star Wars opened in movie theaters and Hollywood (and science fiction) were changed forever. Perhaps if The Fantastic Journey had held on a bit longer, it might have been part of the fans’ journey as well, towards a new and different world for both the series and for science fiction and fantasy in general. An unexpected enlightenment waited just a bit farther down the road. And maybe that is the ultimate purpose of any journey, whether it’s one of a televised nature or a personal one. Those that feel the goal is the nebulous idea of “enlightenment” sometimes forget that it’s not really a goal per se. Enlightenment is never really fully achieved, but it’s the path taken to get there that brings us home, full of fresh ideas and wonder. And that’s what all the characters in The Fantastic Journey were really after, once you look at it that way. All any of them wanted was their own version of enlightenment, their own way home. Aired on Friday @ 8/7 Central? No, the series normal timeslot was Thursdays at 8/7, up against hits The Waltons and Welcome Back, Kotter. The journey to ratings success was troublesome to begin with.